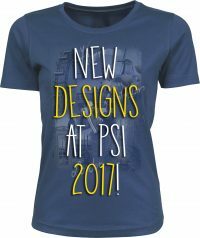 They’re among the most sought-after products at PSI: textiles. More than 40 per cent of PSI visitors come to PSI with a particular interest in textiles. And in 2017, they’ll get more of them than ever before, thanks to yet another expansion of both the Textile Area and the Textile Finishing Area in Hall 10. As a result, Hall 10 will serve as the show’s big fashion hub. Numerous renowned manufacturers, wholesalers and end-users will be on hand to showcase their latest collections and state-of-the-art technology. Stanley & Stella, Stormtech Europe, Roly Gor Factory and New Wave will be among the major textile providers returning to PSI. “Expansion into international markets has become increasingly important for the development of our company in recent years, and we’ve got a lot of new products in this area. PSI is the largest event in the European market, so we practically consider it an obligation to come back this year”, explains Dolores Cávonas, who works in Roly Gor Factory’s marketing department. New Wave similarly considers PSI “the best opportunity to present our large and diverse brand and product assortment at a glance”, according to New Wave’s associate director Andre Bachmann. Gustav Daiber will also be at PSI to showcase their versatile product range. “For Daiber, PSI has always been the freestyle event, because it’s well established that textiles have invariably been considered some of the most popular promotional products. Here we always find the perfect forum for our products and our entire company”, says Gustav Daiber managing director Kai Gminder. Other well-known manufacturers presenting their highlights at the trade show include Tee Jays, ID® Rexholm, KARIBAN and SOL’S. Wholesalers will also be represented in PSI’s textile hall. Participants will include the likes of Falk & Ross and Lynka. “For us, PSI is the biggest promotional products trade show of the year. Participating in this event is part of our long-term strategy, which consists of actively helping to shape textile market trends. It’s also a great opportunity to meet our customers face to face and show them all our new products for the upcoming season. The same is true for new customers. To really understand the quality of our work, you have to see it – touch it, even”, explains Lynka’s senior marketing specialist Krzysztof Szum. Without finishing, a promotional product isn’t a promotional product. BROTHER Internationale Industriemaschinen, one of the world’s leading manufacturers of industrial sewing machines and printers at PSI 2017, will reveal market trends and advancements. ZSK Stickmaschinen can look back on more than 100 successful years in textile machine engineering. Custom-made machines are a big part of their standard repertoire. Visitors can get details about the Krefeld-based company’s portfolio right at their exhibition stand. At PSI, the Leading European Trade Show of the Promotional Products Industry, promotional products professionals gain an overview of the trends and innovations of the industry. In addition, special exhibits and show areas are dedicated to an in-depth look at promotional labelling, printing and finishing technologies, inventions and innovations, and much more. At PSI 2016, 932 exhibitors from 38 countries presented their companies to 16,810 visitors. Following a change in show days, PSI 2017 will take place in Düsseldorf from Tuesday, 10th January, to Thursday, 12th January.